Having a mess in your backpack can be annoying, right? That's how I felt when I was looking a piece of my climbing equipment that seemed to be hiding. Now, things have changed for me thanks to our new ROC 35 backpack. I also remember our old small black diamond bag that contained all quickdraws, tubes and other equipment. We had so much material in there that it was hard to get it out all. And I didn't like the material of the bag. It was like a magnet for leaves, dirt and everything else you find in the forest. I can't tell you how happy I am, as I finally figured out a way to stay organized and reduce my mess when going climbing. Carlos and I recorded this short video for you, as I thought that this way, it gets much clearer why we love this model. Watch us how we usually put our climbing equipment into the backpack. What makes the ROC 35 different to other backpacks? Okay, this still looks a bit messy, but notice that our stuff still stays where it's supposed to be. 🙂 I find it incredibly useful to see immediately where I stored which thing. I don't know about you, but I believe that searching for "hidden" equipment is a factor that lowers your energy. It's not a big thing. But I think it's a subtle factor that has an impact on your concentration. I prefer making the process as smooth as possible to concentrate all my energy on my power and focus for facing the challenge when climbing. That includes the right food, warming up, creating the best possible mental state, and quickly finding the equipment. Being organized makes it just so much easier for you to start climbing, as you don't have to waste any time looking for your stuff. The same goes for the end of the climbing day. When you organize yourself, you have an overview if your equipment is complete or not. I remember a climbing day we almost ran out of time in La Pedriza, Spain. 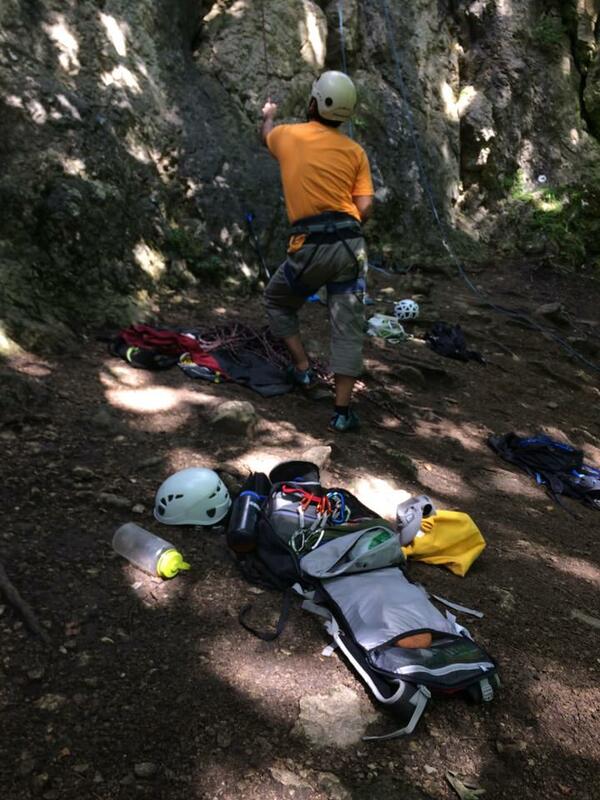 It was the very first time I went climbing there. In the evening, we were about to leave, and a friend was counting once more the quickdraws. A quickdraw was missing. It was hanging in a route that wasn't too easy. He finally managed to get there, took the quickdraw and came down. It was dark already, and we still had to walk around 40 minutes back to the car. It's easy to get lost in La Pedriza, so I was glad my friends knew the way. Something similar happened once when we were climbing in Frankenjura, and it started to rain. Climbing in Frankenjura. Carlos is belaying a friend, while I'm taking the photo. I think the system of fixing the quickdraws this way in the backpack is useful, as you can leave them there without worrying about the material getting lost. Of course, you already need to watch out for the material when coming down. But I still think that, especially when climbing with friends and mixing the material, it's so much easier to check your equipment when you have your material organized. The way you open the backpack, and seeing the quickdraws hanging inside is a big plus. Especially when you're leaving again, you get a quick overview whether something is missing, as you keep everything in its place. As I say in the video, the ROC 35 is okay for a couple if you don't carry too much stuff with you. As we often take another backpack with camera equipment with us, we would not use a second backpack filled with climbing equipment. First, I had the impression that the space for 10 to 12 quickdraws is not too big. Now, I think it's sufficient, as the routes we usually climb are not that long and that it's more about organizing yourself and using only the material we need instead of taking the entire equipment with us. Thanks for the tips guys! 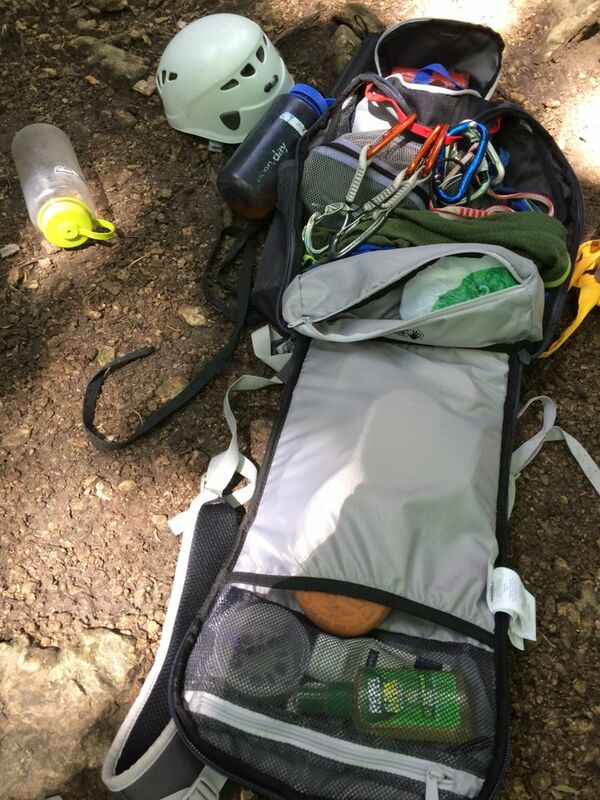 That backpack looks great… I’ve lot count of the number of times I have sifted through my gear trying to find what I need at the crag! Right, I guess that’s something many climbers know pretty well! 🙂 Thanks for your comment! I’m happy you found it valuable.